Faculty of Transportation Sciences CTU in Prague has permission for forensic activities from the 22th July 2002, according to this, Faculty of Transportation Sciences is asked exclusively from court and Police to elaborate expert's audit opinions or these, which are necessary to be verified using specific research approach. The range of forensic permission was established for transportation technology and communication, logistics in transportation technology and communication, transportation engineering and communication, traffic infrastructure, management and economics in transportation technology and communication, automatization in transportation technology and communication, transportation systems and technology and engineering informatics. On the 15th of November 2006 was established “Department of Forensic Experts in Transportation“ as a self-sustaining department in frame of CTU in Prague, Faculty of Transportation Sciences. Pedestrian safety is nowadays one of very important criteria in case of vehicle safety evaluation. Vehicle certification standards are based on vehicle frontal part testing with impactors, which represent certain body parts of adult pedestrian. The risk of impact consequences for children is proved by head impactor test only. 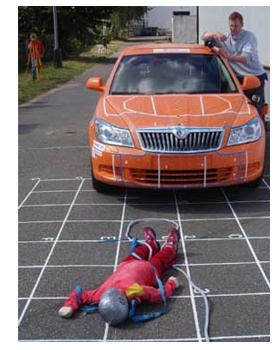 CTU in Prague, Faculty of Transportation Sciences performed series of dynamical passive safety tests of passenger car collision with P6 (child, six years of age; 1,2 m; 22 kg) dummy under different impact speeds (10, 20, 30 kmph). There were contact zones and deformations of vehicle frontal part followed within dynamical tests on the one hand and on the other hand the result accelerations of particular dummy parts were detected. The dummy was facing the approaching vehicle, heel standing in longitudinal axis of vehicle and instrumented in the following way: 3axes accelerometer in the head, 3axes accelerometer in thorax, 3 axes accelerometer in pelvic area, 1axis accelerometer in the knee area for acceleration measurement in sagital plane, 2 strain gauges half-bridges on left femoral structure for contact force detection. The aim of this experimental work performed in frame of fundamental research is a detail description of child pedestrian kinematics, primary and secondary collision consequences comparison as well as input data for mathematical simulation of the whole dynamical process. Technical report OCTAVIA II_2010 is in process. TEST I 10 kmph, TEST II 20 kmph, TEST III 30 kmph, TEST IV Airbags. Videos in DVD file (iso file 650MB): DVD, cover EN, DVD skin.